It can take a thousand years for an inch of topsoil to form, and sometimes only a few moments for it to erode away. So at the Agricultural Research Service’s Forage and Range Research Laboratory (FRRL) in Logan, Utah, a dozen scientists are finding the best plants and practices for protecting and repairing the fragile soils on the dry rangelands of the western intermountain states. The FRRL has its roots in early work by U.S. Department of Agriculture scientists who teamed up with U.S. Forest Service scientists in 1907 to manage the range and forests around Logan. FRRL research leader Jack Staub and his team of 11 scientists continue the tradition of working with other state and federal agencies to develop new grasses and forages for pastures, turf, and rangelands. Native plants that once colonized these rangelands are being pushed to the brink by drought, wildfires, overgrazing, extreme temperatures, erosion, mining, military training exercises, and other ecological disturbances. Rangeland managers need to have access to plants that can maintain soil, increase ground cover, and provide forage even in these harsh environments. 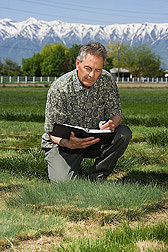 In Blue Creek, Utah, geneticist Kevin Jensen examines Snake River wheatgrass in a nursery plot used to identify plants with good persistence, biomass, and seed production. Such traits can help this native plant compete with invasive annual weeds, like cheatgrass. Sometimes—especially when the landscape has undergone severe deterioration—it’s necessary to use introduced grasses to jump-start the restoration process. Native plants can be brought back into the picture as soil conditions improve. As part of the long-term restoration process, FRRL scientists often go overseas to gather germplasm to use in developing new cultivars. Prime candidates for collection include a range of grassy relatives that have evolved over millions of years on the South American highlands and Eurasian steppes. Developing a new plant cultivar, which can take decades, starts with figuring out how the plant will be used. Will it be forage for livestock or wildlife? Will it anchor soils after fire has burned away existing vegetation? Will it keep an invasive annual species—like cheatgrass and medusahead—in check? Or will it need to be all of the above? 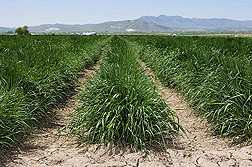 Hycrest crested wheatgrass was developed by scientists at FRRL, the Utah Agricultural Experiment Station, and the USDA Soil Conservation Service (now the Natural Resources Conservation Service). Released in 1984, it was the leading crested wheatgrass grown on the western rangelands for around 10 years. It provides forage in early spring and summer, stabilizes soil, holds its own against aggressive invasives, and thrives with as little as 8 inches of precipitation a year. FRRL scientists have now developed Hycrest II, which was bred for reseeding rangelands that have been overrun by annual weeds after wildfires, soil erosion, or other disturbances. This cultivar offers faster establishment of more seedlings per unit area than Hycrest. Other rangeland remedies are on the way. Vavilov II is a new Siberian wheatgrass cultivar and a close relative of crested wheatgrass cultivars. Vavilov II, like Hycrest, will help damaged rangelands combat cheatgrass on especially dry and harsh sandy soils. It’s already been distributed to six U.S. Department of Defense (DOD) facilities and may end up as part of a seed mix used on more than 40 DOD facilities that sprawl over a million acres. Russian wildryes, originally from Russia and China, were introduced into the United States in the 1950s in part because they withstand drought more readily than crested wheatgrass. FRRL scientists have been breeding varieties of Russian wildrye since 1981 and have improved its relatively slow seedling growth and development. In 2006, they announced the release of Bozoisky-II, a Russian wildrye cultivar that provides winter livestock forage. It shows a dramatic increase in seedling establishment over other cultivars. As competition for water supplies increases, FRRL scientists are developing pasture and turfgrasses better adapted to reduced irrigation. For instance, the meadow bromegrass cultivar Cache begins growth in early spring and stays green and succulent longer than tall fescue and orchardgrass. It was recently released for use on irrigated and semi-irrigated pastures. Cache provides livestock producers with increased total dry matter production and seed yield under limited irrigation. 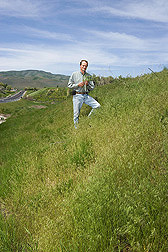 Agriculturalist Spencer Larsen studies a roadside bank covered in ripening cheatgrass in Utah. Cheatgrass can quickly establish in areas that have been severely disturbed by fire or erosion. Other FRRL plant releases were developed from native plant materials collected in the western United States. Germplasm used to create the slender wheatgrass FirstStrike, which can rapidly establish itself on military training grounds, was obtained from several sites in Colorado and Wyoming. Compared to older releases, it has better persistence and seedling vigor under extremely dry conditions. Indian ricegrass is widely distributed west of the Mississippi River, and FRRL scientists used several Colorado accessions to develop White River Indian ricegrass. This cultivar can establish itself more readily than other ricegrass varieties and could be an excellent candidate for revegetating land where oil and gas have been mined. Discovery Snake River wheatgrass, Continental Great Basin wildrye, and Recovery western wheatgrass also become established more easily than other native grasses, help burned lands recover from wildfire, and limit the spread of invasive weeds. Like Secar, another Snake River wheatgrass, Discovery could be used as a surrogate for bluebunch wheatgrass in rangeland seedings. Last but not least are legumes that can help fix nitrogen in the soils of nitrogen-challenged rangelands. NBR-1 Germplasm Basalt Milkvetch and Don falcate alfalfa are two legumes that have been developed to revegetate western rangelands. Neither is commercially available yet, however. The nonnative and native grasses and legumes released by FRRL provide land managers and growers with products for diverse, sustainable agriculture.—By Ann Perry, Agricultural Research Service Information Staff. This research is part of Pasture, Forage, and Range Land Systems (#215) and Plant Genetic Resources, Genomics, and Genetic Improvement (#301), two ARS national programs described at www.nps.ars.usda.gov. "A Range of Plants For Rangeland Rehab" was published in the February 2010 issue of Agricultural Research magazine.